Letter to Wikileaks Supporters: Bradley Manning’s hearing is FINALLY coming up! This email was sent out to the Wikileaks Support Announcement list. As I’ve said before, I believe that the most important task related to defending Wikileaks is to defend Bradley Manning. His pre-trial hearing (after more than 500 days in jail) will be announced any day now. We would love to have a large and immediate response to send a message to the powers-that-be. We were able to improve Bradley’s conditions in jail through our activism. A large turnout will help Bradley get a public, instead of a closed, trial, which in turn tremendously improves his chances of going free or getting a shorter sentence. San Francisco Bay Area only: please send an email containing your phone number, name, and zip code to michael AT couragetoresist DOT o r g (Michael Thurman of Courage to Resist and the Bradley Manning Support Network). The BMSN has set up a text-message system to send out an alert whenever the hearing is announced. The plan is for a protest march from Market and Powell to Market and Castro that evening at 5pm (or, if the announcement is made in the afternoon, for the following evening). A trial and situation like this is often volatile and subject to change anytime; by having your phone number they can let you know of protests, vigils, and events which will often be on relatively short notice. 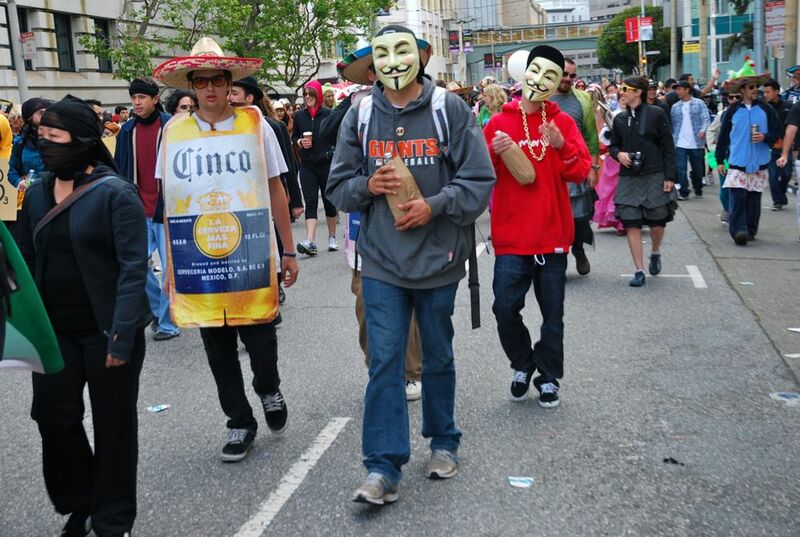 Now for some levity: we had four people at Bay to Breakers with Anonymous-style V-for-Vendetta masks and Bradley Manning stickers. 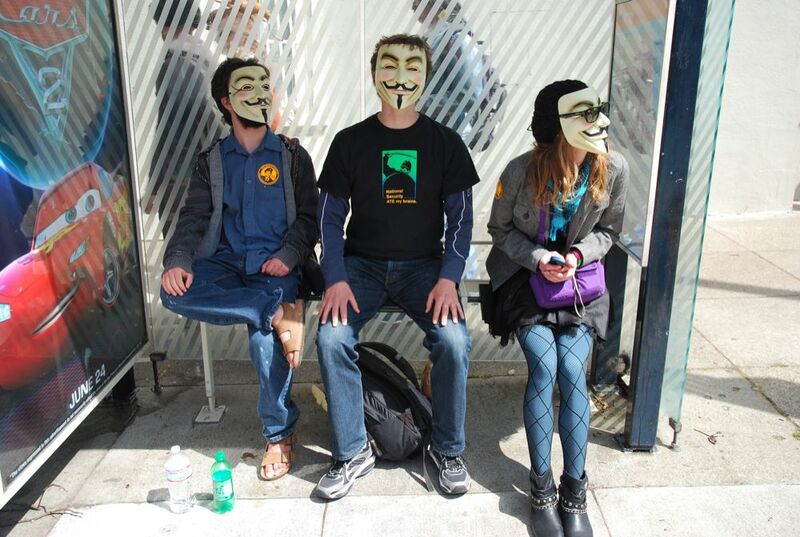 We got a couple pictures of “Anonymous waiting for the bus”. We had a great shot planned on a billboard, but there was a cop attending to a passed-out woman right by the fence we would have had to scale. Discretion being the better part of valor, we let it go. We also handed out some V-for-Vendetta masks to others. As you can see, a couple of guys in hoodies took them and look more suited to them than we did! I find the Occupy Everywhere movement fascinating and uplifting. Who knows where this is going, but one thing’s for sure – this is a defining break. Right after Cablegate, during the immediate, fierce repression of Wikileaks, I could feel the rupture. Like that scene in The Matrix where the cat walks by a second time, there was a glitch. The façade of rationality and due process was ripped, and we could see through to the reality of naked power. I could feel the rumblings and knew 2011 would be a revolutionary year. Well, first we had Tunisia and Egypt, and many others, and now we finally have our sea change here. I don’t think it’s an exaggeration to trace a direct line of causation from Bradley Manning’s (alleged) acts to Cablegate to the Arab Spring to Occupy Wall Street. However our society is reconfigured in a month or a year or five or twenty or fifty, Mr. Bradley Manning will have a important place in the history e-books. And with any luck, and our help, he’ll be free long before then.